London celebrates the poinsettia, the UK’s number 1 Christmas houseplant, with an exciting installation co-created by Stars for Europe and McQueens Flower School. 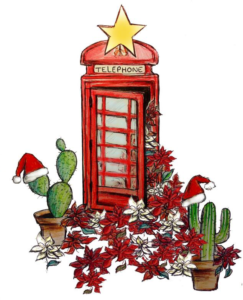 Highlighting the poinsettia’s Mexican heritage, ‘Dial-a-Star’ features an iconic London telephone box positioned within a landscape of white and red poinsettias, alongside some classically architectural cacti – joining to form the tricolour found within the Mexican flag. The title, ‘Dial-a-Star’ is a reference to the poinsettia’s other name of ‘Christmas Star’ as well as a playful nod to this plant’s popularity over the festive season. Since that time it has become a festive staple for the home, and is now the UK’s number 1 houseplant over the Christmas season. 135 Bethnal Green Road, London, E2 7DG, on Friday 23 November 4pm-7pm, Saturday 24 November 10am-6pm and Sunday 25 November 10am-6pm.